Welcome To Laurieville! Population 1.: Bwaa haa haa !!! Oh Martha! I will NEVER be this organized. My tool area will never be this clean. But we gotta have a dream, right? 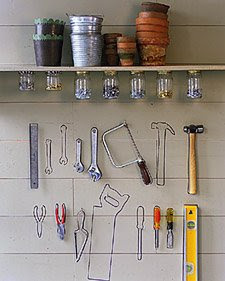 If you want your own tool wall, (ha ha ha, oh sorry), go here for Martha's directions. A parental unit would be so proud if he were blessed with such a neat legacy... a neat progeny. But, consider this... you follow Martha's fine example, every tool is in its outlined place... then something goes missing, a Phillips screwdriver is gone... in its place an empty outline... A condemning outline... Where was the offending Phillips? You blame everybody and nobody... Harmony becomes illusion, peace is missing just like the screwdriver. Alienation and loneliness follow... finally desolation... AND IT'S ALL MARTHA'S FAULT! All in all, I'd rather you be happy and at peace and if the cost is "neat"... so be it! Who has time to hang the tools let only outline them?!! She is crazy.